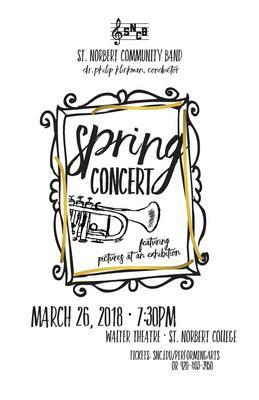 This is the Spring St. Norbert Community Band Concert featuring the St. Norbert Community Band. The Community Band is made up of St. Norbert College students and faculty as well as area community members. The Community Band is under the direction of Dr. Philip Klickman. This concert was performed in the Walter Theatre in the the Abbot Pennings Hall of Fine Arts. St. Norbert College Music Department, "St. Norbert Community Band Concert" (2018). Music Performances. 38.